Internet make this world a global village for all. It make communication very fast. You can also entertain with your internet connection. No almost every one has a personal internet connection to communicate with others. There is a lot of speed tariffs available according to your needs. ISP Commits speed that you order in your DSL (Digital Subscriber Line. But even after you ordered 10 MB Connection, your internet connection still slow and imitates you as youtube videos etc still stuck at buffering and slow browsing of websites. Reason is very simple, your ISP (Internet service provider) does not give you the committed speed as they give you a shared connection and there may be so many users that are using the same IP (internet protocol). You can check the actual speed of your internet connection. How to Check Your Internet Connection Speed ? There are many a lot of online tools to check actual internet connection speed but the easiest way to check internet speed is by following given below method. You will see two texts as "Begin Test Recommended Server" and "Begin Your Preferred Server"
Now click on "Begin Test Recommended Server" and wait for few seconds. 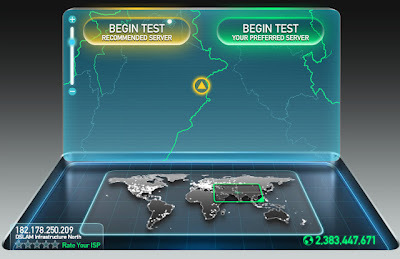 After few seconds, this free online tool will tell you Your actual Internet speed in Mbs.